I was recently asked “what does an ideal landing page look like for someone offering consulting services?” It’s a great question. For over 15 years I’ve been a consultant and built successful consulting companies. I’ve also co-founded several online businesses. So this is a topic I’m familiar with and passionate about. Let’s get right into it. Here’s what you need to know about creating a landing page if you’re a consultant marketing your services. The relationship the buyer and consultant will create and have is critical. For that reason, the buyer of consulting services will look to quickly gain a sense of what it will be like to work with you as soon as they land on your page. As marketers when we create a landing page to drive leads or promote our product we work hard to position it in a way that it grabs the attention and interest of the buyer. That makes sense because the buyer (user) is most interested in whether or not the product will help them overcome the challenge they’re facing? Will it help them get closer to the result they are after? And are the benefits of using the product clear and believable? When you’re offering consulting services, YOU are the product. The user, in this case the buyer of consulting services, asks slightly different questions. Questions your landing page must answer in order for it to be successful. Who is the person or company offering these services? Do they have the expertise to help me solve my problem or reach the result I’m after? Put another way; are they a specialist and expert? Do they have a track-record of success and results? What makes them better than any other person or company in this industry? These questions are driven by the nature of the buying process in consulting. Consulting services involve human interaction. They are unlike signing up for an online service or buying herbal supplements. When a buyer hires a consultant they know they’ll be interacting with them on a regular basis. In just a few moments I’ll share with you the specific elements to include on your landing page to achieve optimal results. First, let’s talk about your personality. I mentioned above how important the relationship is in the buying process for consulting services. That’s why you got to show your face. Don’t hide behind your logo and don’t try to make yourself look like a bigger company than you are. It rarely matters. Remember, your prospective buyer will hire YOU because they like you. Because they believe that you can help them. And because they trust you to deliver results. Not because you have a beautiful logo or a fancy sounding name. 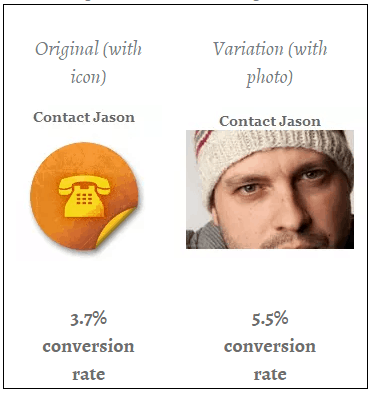 VWO published results by one of their users, Jason Thompson, who swapped out a contact icon for his face and saw conversions increase 39%. 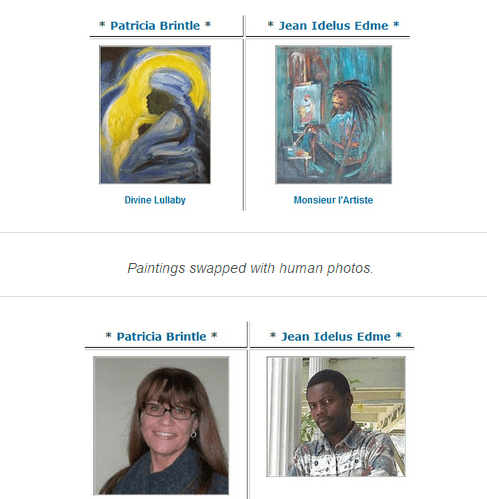 KISS Metrics reported that when Medalia Art added faces to their homepage they increased conversions by 95%. Steven Essa, a webinar consultant has his photo on his main landing page. Neil Patel, of Quicksrpout, KISS Metrics and CrazyEgg fame, has his photo clearly displayed on his landing page where he offers consulting services. 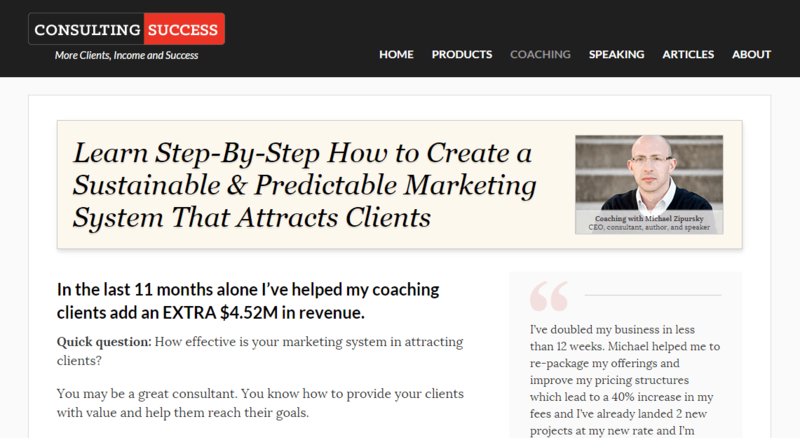 On Consulting Success we ran a test on our coaching offer page and saw a 54% increase in conversions when my photo was added. The common question I get is, “which is best?” I’ll save you the drama and tell you straight up, there isn’t a ‘best’. It depends on what stage the buyer is at in the buying process and how much they trust you. 1) The buyer is familiar with you. They’ve read your blog posts, seen you speak at a conference. Maybe they’ve listened to your podcast. Whatever it is, they know who you are and feel a level of trust and comfort with you. When this is the case I’ve found that the direct consultation offer works best. A direct consultation offer is when you give the user the option to fill in a form or book a call with you directly (if they qualify). They don’t need to wait for autoresponder messages and a whole education campaign. They get to go straight to arranging a consultation with you. On my Coaching page I provide a direct consultation offer. This works great because the consultants who read Consulting Success are looking for help to attract more clients and increase their average project size and fees. They are familiar with my work and they are reading my articles or getting my newsletter already. So when I point them to this Coaching page and provide a form for them to request a consultation – a significant number of people fill in the form. You can see the full page and example here. Here’s another example from Jon Loomer. On the sidebar of Jon’s homepage he has a clear offer for his coaching/consulting program. When someone clicks on this ‘ad’ they are taken to his dedicated page with his direct consultation offer. 2) The buyer isn’t familiar with you. If you’re driving cold traffic to a landing page and the buyer isn’t familiar with you, it’s unlikely a direct consultation offer will work. If you’re a well-known company or personality, this can work. However, for most consultants in the marketplace without much recognition and visibility, you want to avoid going direct. Instead, your landing page offer should be focused on providing the buyer with valuable and educational information. That way you’ll be able to prove to them that you are an expert in the area they are searching for a solution in and that you can help them. They don’t need to take on much risk, other than giving you their email address to correspond with. The approach that you take to educate them can be a video, report or other media that your buyer will be likely to ‘consume’ and then act on. One of the biggest mistakes I see consultants making on their landing pages is a lack of a clear call-to-action (CTA). As this Unbounce article and many others prove, having a relevant and value focused CTA can significantly increase conversions. Your CTA has to communicate the benefits of your offer. You must give the buyer a specific reason to take action. And to do it NOW. Simply saying “Contact me for a free consultation” isn’t enough. That’s like suggesting to someone that they ‘download your software’ without first explaining what they’ll get when they download it. 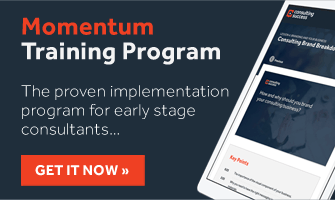 Here’s a great example of a clear CTA from the consultants at Conversion Lab. Focus on value. Be clear. Communicate exactly what your buyer can expect. This is especially critical when you’re making a direct consultation offer. A buyer won’t want to get on the phone with you if they don’t know what’s in it for them? What can they expect to leave that call with? The better you communicate this the greater response and conversion you’ll see. One of my clients, an international Food and Fragrance consultant quickly learned how important this is. Trevor (his real name) was sending out a newsletter for over 15 months. He had hundreds of people in his database. Yet each time he sent the newsletter out he got no response. He was sending information out, but no one was taking the bait and reaching out to him. We reworked his CTA so that his ideal client would know exactly why to take action and contact him. The first time he sent out the updated CTA he got 5 responses from ideal clients within 24 hours. Every time Trevor sends out his newsletter with his new and improved CTA he receives 5-7 hot leads wanting more information about his services and hiring him. That’s how powerful an effective CTA can be. It’s an area that most consultants can and should spend some time on as the upside is significant. Headline – which should be your value proposition (also known as your USP or Unique Selling Proposition). The ‘Hero’ Shot – in most products this is an image or video of the product. With a consulting offer it should be a picture of you. Benefits – what will the buyer/user get out of contacting you? Why should they watch your video or read your report? Why should they fill in the form to schedule a call with you? How can you really help them? Proof – has your work been featured? Can you share testimonials and results clients have experienced? What proof can you provide to show that you’re the ‘real deal’? CTA – your page should include one (and only one) CTA. You’ll decide this depending on what stage your buyer is at in the buying process and how familiar they are with you. Just like selling a product, creating a successful landing page with your consulting offer requires testing. You’ll want to test different offers, headlines, photos, CTA buttons. Producing an optimal landing page in this industry isn’t rocket science when you follow these guidelines. But testing is still critical to success. Run as many thoughtful tests as you can throughout your whole funnel. 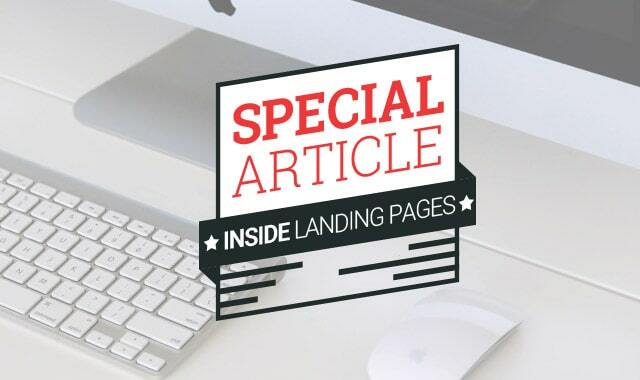 Your landing page is just one element – an important one. Don’t forget to look at your traffic source, ads, thank you pages and follow up sequences as well. Each and every one of these elements play a role in helping you to achieve higher response and conversion rates. Want a Professional Consultant Website to Generate More Leads and Business? If you’d like to discuss how to improve your online marketing and web presence so that you can attract your ideal buyers consistently and position yourself as an authority in your marketplace with a professional website and brand contact us here. What are your thoughts? Would you like more posts like this? Or never again? Let me know in the comments below. Thank you for reading! Great post. Hope to see more. Great piece Michael. I like how to share the results of the various tests, to show the power of doing one’s landing page right. Thanks Dan glad you enjoyed it! Terrific guide. Thanks Mike – there are some ideas here new to me. Really useful information here. I’ve immediately emailed my web developer to start work on our CTA’s – or should I now say, my CTA’s as they’ll have my picture on them! Nice one Martin! Way to take action on that! your persona beams through.. If you limit yourself to your belief that all people see is your physical features, you come across that way.. A truly beautiful woman is far more than her looks; her beauty is in the depth of her being.. same said for you..
be who you are. PPS let someone pick the image for you. Great post! Love these examples! Thanks for the useful information, Michael!